Airtel 3G will now cost you less. The telecom operator has announced new 3G tariffs for its Prepaid and Postpaid subscribers. 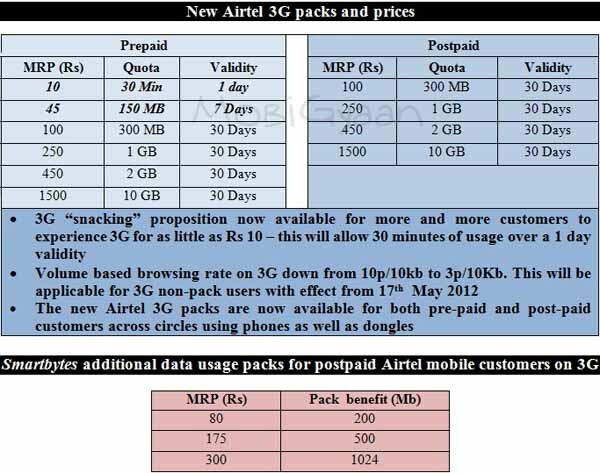 Airtel has announced some really interesting 3G Plans, for instance its Prepaid customers can now pay Rs. 10 to enjoy 30 minutes of 3G services, valid for a day. Also it has reduced the default 3G rates from 10p/10KB to 3p/10KB, that’s cool. Airtel has also introduced Smartbytes additional data usage packs for its postpaid customers on 3G. Smartbytes basically offers additonal data to the at a certain price metnioned above. Are you an Airtel customer? What are your thoughts about the new 3G plans?